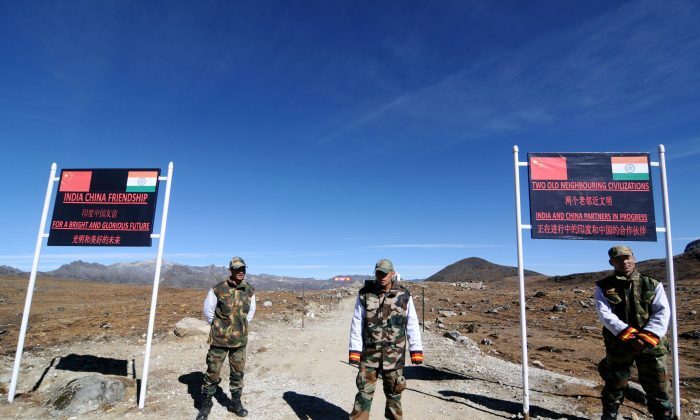 NEW DELHI—India’s government rejected China’s objection to its plan to build a highway on the de facto border with China in Arunachal Pradesh, saying it has the right to develop infrastructure in its territory. “We are at freedom to construct a highway in our territory,” said Kiren Rijiju, India’s Union Minister of State for Home affairs on Saturday, according to the Economic Times. China considers Arunachal Pradesh a part of Tibet and refuses to recognize it as Indian territory. India and China share a long-disputed border, and went to war once over it in 1962. In the lead-up and during Chinese leader Xi Jinping’s visit to India last month, soldiers from the People’s Liberation Army (PLA) passed the LAC, creating a standoff on the border. Last Thursday, Chinese and Indian officials from defense and foreign affairs met in New Delhi to discuss ways to prevent such incidents from repeating. China has built up the infrastructure on its side of the LAC with roadways, railways, airports, and fiber optic cables. India says it needs to catch up, and for a long time has allocated money for projects on the border. In June, the Indian government promised $813 million to improve infrastructure related to education, healthcare, and electricity to encourage Indians who left their homes there to return. Srikanth Kondapalli, a professor of Chinese studies at Jawaharlal Nehru University in New Delhi, says India is encouraging its people to move back to give it leverage in border disputes. “Settling people in the border areas will then be a factor in the territorial dispute resolution,” Kondapalli said. Rijiju also said citizens on the border are the eyes and ears of the government and can alert authorities when Chinese troops transgress into Indian territory.He said the road is for their sake. “The roads in border areas are for the benefit of indigenous people and India,” said Rijiju on Friday, according to the Times of India newspaper. The road is set to be over 1,240 miles and will cost India $6.5 billion. NEW DELHI—India banned the import of cosmetics and cosmetic ingredients tested on animals on Monday, becoming the only country in Asia to do so.